This example uses MS SQL Express database. There is one table in the database named Templates. 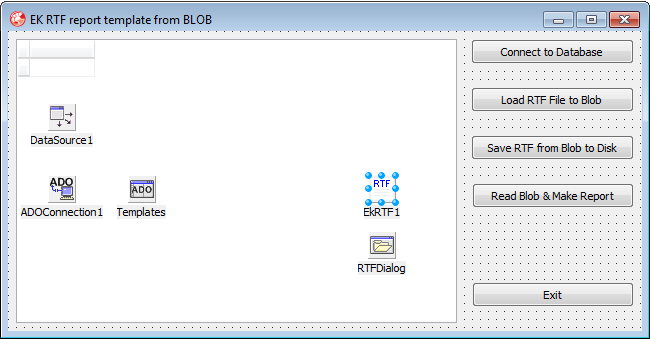 Table contains BLOB field with name Data. Demo application expects that at least one record is inserted in the table. Database is not included in the archive. You may use the script below to create similar table in your environment. There is ADOConnection component on the form with ADOTable component. Table component is connected to the Templates sql table. Pascal unit contains procedures for writing, reading rtf file from BLOB field, and making report from template stored in memory.